F1 this season is all about knowing your ABC’s from your 123’s with new technology terms like ICE, MGU-K, MGU-H, TC, ES, CE-K, CE-H, CE PSU or CE DCDC. I am not going to pretend I have any idea what any of those mean, and judging from some of the driver’s reactions, neither do they. What I do know, however, is that we’re going to be hearing these terms a lot over the coming season, and for fear of being left in the dark, I will have to do some research into what exactly all this tech is. F1 has also reverted back to more of an engine formula than anything else. The new hybrid turbo’s sound… interesting (definitely something to get used to), and they are still such new technology that nobody really knows what’s happening with them as witnessed by the number of engine retirements we had during the race, including Hamilton, Vettel, both Lotuses and the Caterham of Ericsson. The race itself got of too a shaky start with an aborted start thanks to a stalled Marussia; and based off of qualifying, it looked as though the two Mercedes would be unstoppable; but engine problems put Hamilton out after only a few laps. Chaos at the start also saw Kobayashi crash into the back of Massa’s Williams, eliminating them both from the race. 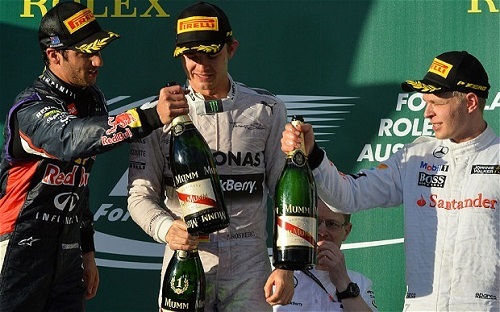 Nico Rosberg went on to claim an emphatic victory though, winning by a clear margin over Australia’s new favourite sports hero Daniel Ricciardo. But it turned out to not be Red Bull’s day as hours after the race as he was found to have breached technical regulations regarding fuel flow (get used to this, I think it might happen a lot!). The other Red Bull car of Vettel was also not so lucky, and he retired after only five laps due to engine failure. Kevin Magnussen, my Driver of the Day, overcame a rather skittish start (Everybody! Slide to the Left! ), to finish in second* on the podium, looking cool, calm and collected the whole race, despite this being his first ever F1 race. Following on from Magnussen’s impressive performance, Button came in just behind in third place, a marked improvement for McLaren from last year’s dismal season with both drivers now on the podium. Both Ferrari’s finished in the points, with Alonso in fourth and Raikkonen in eighth (I’m disappointed here. I expected more from them), with Alonso proclaiming that the reliability was good for the team. It was a bit of Groundhog Day for the Ferrari driver though, as he found himself stuck behind Hulkenberg for a large majority of the race, just like in 2013. Hulkenberg himself went on to finish in sixth place*. Both Lotuses retired from the race, Grosjean with 11 laps to go, and Maldonado with 31 laps to go. We’ll consider this a test session, and hope that they can be a little bit more competitive come Malaysia. Williams Racing can be positive after this race however, as Bottas once again proved his mettle, finishing in sixth place. Massa, the unluckiest man in racing when it comes to the Australian Grand Prix first corner, was knocked out by Kobayashi, but I have no doubt that he will redeem himself next time out. There wasn’t too much else interesting from the race. Props to Marussia for having both cars finish after both stalled on the installation laps. Max Chilton continues with his record of completing races. Danni Kvyat of Torro Rosso was also very impressive on his debut, finishing behind his teammate and in the points! Both Sauber’s also crossed the line, with Adrian Sutil having impressive runs in his car between pit stops, something the Sauber seems to excel at. It’s a brave new world out there for F1. One where the past has little bearing on the future, and where change can bring opportunity. The question is, who will rise with the challenge as this season progresses? Bring on Malaysia. Driver of the Day: Kevin Magnussen. 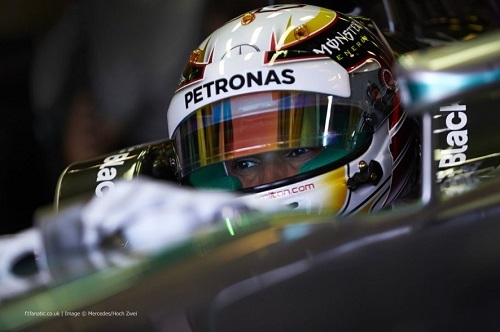 Cool, calm and collected in his debut F1 race, finishing on the podium. Rookie of the Day: Kevin Magnussen. Enough said. 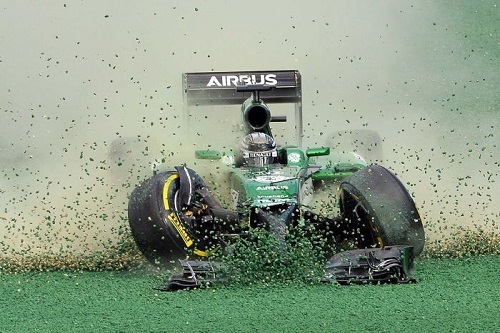 Failure of the Day: Kamui Kobayashi. I expected more from the crashtastic Japanese driver.